Follow along with us through the end of the year to learn about our programs, grantees, survivors, co-survivors and community impact. Today, meet Mike. He is a breast cancer co-survivor and longtime supporter. See how Komen Charlotte has had an impact on his journey. In 2006, my wife Shari Lynn was finishing 9 months of treatment for breast cancer & just starting to feel human again. We had friends who’d held fundraisers for Susan G. Komen before, but we’d never attended Race for the Cure. Friends had encouraged us to participate and fundraise. We set up a team & sent emails asking for support. Why? Because 1 in 8 women will be diagnosed with breast cancer in her lifetime & more selfishly, Shari Lynn received her diagnosis at 34 with almost no risk factors & no family history. We were compelled to raise awareness & dollars to help others. 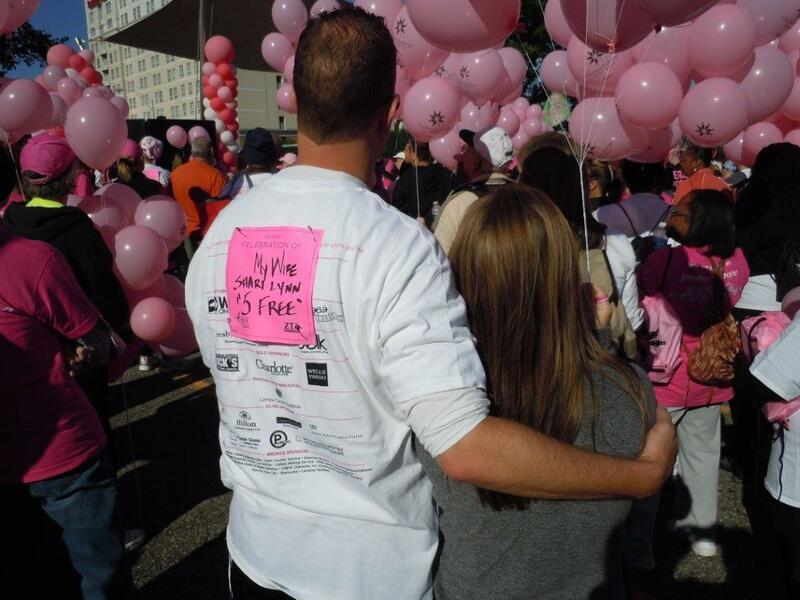 In October 2006, we joined about 12,000 others at Race, including hundreds of fellow survivors & co-survivors. We were awe-inspired by the love & passion that morning. The Survivor Ceremony was especially poignant, giving us hope that Shari Lynn would beat this disease & live a long, healthy life. We raised over $16,000 that year & have been incredibly blessed every year since with support from family & friends. The following year, I was asked to join Komen Charlotte’s Race Committee. I drank the Kool Aid & haven’t stepped away since. Many from this Committee have become my closest friends. Our roles have changed over the years, but all of us continue to share the common goal to end breast cancer forever. Working with Komen Charlotte has enriched my life in so many ways. Anything that I’ve given in time or treasure has returned to me ten-fold. Komen Charlotte provided community and belonging when Shari Lynn and I needed it most. We needed to know we were not alone in this fight. The Komen Charlotte family has never let us down & it’s an honor to be involved with such a competent, caring, passionate, trust-worthy organization.